I showed this carbine before, but this time it’s in a more realistic setting — with the user behind stout cover. While no match for 30-06AP, the tree would at least stop buzzgun emissions and buckshot. With the red dot, the carbine can be realistically employed out to 250m to good effect. 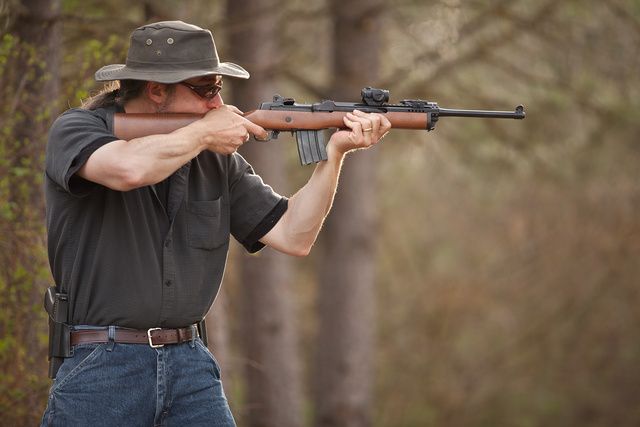 If you aren’t a fan of the round, Mini14 fills a similar niche with .223 — shown here with the same red dot and light, also on an Ultimak mount. This entry was posted in rifle, self-defense, weapon and tagged M1 carbine, red dot, Ultimak. Bookmark the permalink. That tree wouldn’t stop 30-06! Maybe it’s an optical illusion but it looks like it’s 6 feet thick! 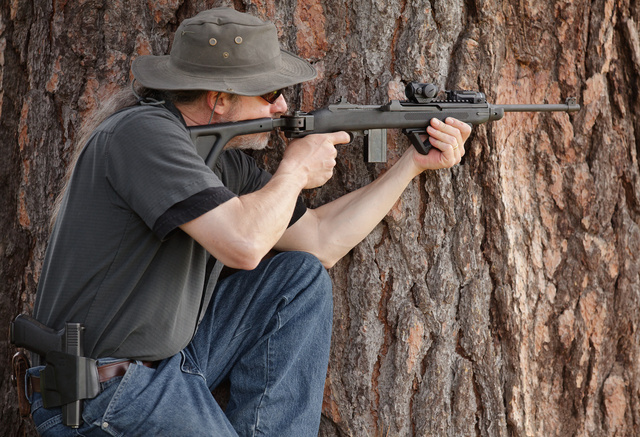 I’ve seen 30-06 go through 3 foot of pine but I’m dubious with a hunk of wood like that in the picture….just sayin. He’s not protected by the middle of the tree but by its edge, so there isn’t the full 6 feet of lumber. Good point, and technically, if I can see the target, at least part of me is completely exposed – zero inches of pine, unless I’m using a parascope of some kind. M1 Crbine, like the Garand and the M1A/M14 continue to be very effective weapons. The weakness on M1 Carbine is magazines. Make sure the mags you are using actually work. Many older GI magazines are worn out, some just need new springs. Brand new GI magazines are available from Riverbank Armory or you can get current production magazines from Kahr. The purist in me cringes at the modern furniture and sight on the carbine, but it certainly looks functional. As long has he keeps moving after taking a shot, he should be OK. There are YouTube videos of consistent hits on steel plates out to (and beyond) 200yd. On one of them, you can see the arch of turbulence from the bullets’ passage. I’m not sure what “purist” means. Does one favor pure looks, pure functionality, or devotion to the original configuration? But there were several “original” configurations, one of which included a folding stock at a time before there were suitable synthetics or reflex sights. I could mock the idea of “purity” as faithful to the original configuration by asking if you prefer 7.25″ floppy disks and 640K of memory, if we’re talking personal computers. Otherwise I suppose we could go back to the vacuum tube computers of the 1940s, such as Colossus of 1943. But that would be somewhat unfair. Or would it? Maybe we should look at The Original firearm, which most likely had no more of an ignition system than a simple touch hole, no stock as we would recognize it, certainly no rifling, was loaded from the muzzle, and you’d poke a hot stock into the touch hole to fire it. Fire locks are for sissies. Metal cartridges? Bah! If the first man to ever build a firearm had meant the firearm to have a stock, a lock, rifling and take metal cartridges, he’d have built it that way. Sorry. I do like the looks of the wood stock, I do own several firearms of the wood and blue steel variety, and I admire the looks of the 1862 Colt Navy revolver a great deal, but they are after all tools, first and foremost, and utility has a beauty and a purity all it’s own. As much as I like AR’s & AK’s, I love seeing some of the other options out there in some great photography. I have the mini-30, which is the 7.62×39 version. Just an excellent, tough little rifle.